With any luck, heart failure will soon be a thing of the past. Researchers at Harvard University and other participating institutions have invented a robot that literally hugs your heart to keep it pumping blood. Their research is in response to the drawbacks of traditional ventricular assist devices (VADs), which remove blood from the heart before pumping it back into the aorta or pulmonary artery. The problem is that these artificial devices are in direct contact with the blood, which increases the risk of blood clots. Harvard graduate student Ellen Roche and her advisor Conor Walsh decided to make a similar device, except their device never comes in direct contact with blood. 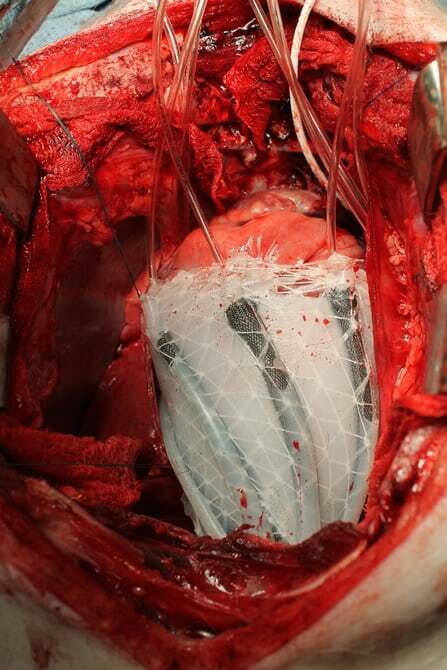 They utilized soft robotics, contraptions made of flexible materials, to work with the complex rhythms of the heart. The silicon device is essentially a sleeve that contains actuators that contract when filled with pressurized air. When the device is placed around a heart, these contractions can be used to keep the heart pumping, and the movement of the device can be controlled by adjusting the airflow. “Even as a patient’s disease condition changes, you could modify the level of assistance provided by the sleeve,” Roche told IEEE Spectrum. The work is published in the journal Science Translational Medicine. The team tested their creation on pig cadavers, a synthetic heart, and even a live pig with a failing heart. When the device was connected to the live pig, it restored blood flow back to baseline. Though many more animal tests will be needed first, the team hopes to conduct a longer-term study on human participants at some point in the future, as well as research how they could reduce inflammation on the heart’s surface. Heart disease costs billions of dollars overall and affects more than 41 million people globally. Every year, the medical industry proposes new potential treatment options and even cures, but thus far has failed to produce a clear-cut solution to the problem. If this invention proves successful on human subjects, it has the potential to save millions of lives.